How a woman feels about her body has a lot to do with her overall self-confidence. When breast size or shape is an issue, many women turn to breast augmentation. Your reasons for breast augmentation are as unique as you are. That is why it is important to have a good understanding of your personal needs and expectations and be able to express them to your cosmetic surgeon. During your consultation, a full medical history and breast exam is done. Full chest measurements are obtained with the Bodylogic System to ensure proper sizing for implants. 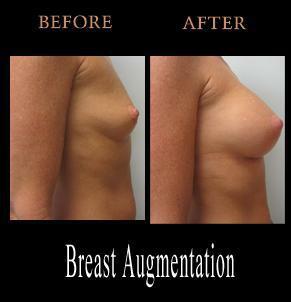 Breast augmentation is a day surgery procedure. Our office is equipped with a private, state-of-the-art surgical suite. General anesthesia is used and administered by licensed anesthesia providers. Most breast augmentations take from 1.5 – 2 hours to perform. Specific written instructions are given for post care. Most patients can return to work within a few days depending on the type of work they do. Strenuous exercise is avoided for a couple of weeks. Post-procedure breast massage exercises are also taught and reinforced by our nursing team. Special post-procedure support bras are ordered for each patient according to their size and shape. Please note, these are sample prices and each individual is different and pricing may vary.